of activities and support for BHM throughout Wales. 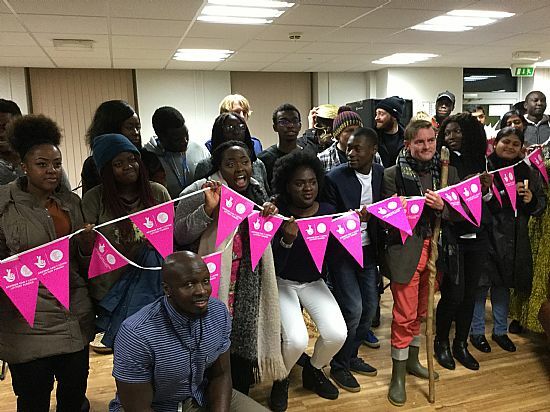 Students from the African Caribbean Society at Bangor University "Celebrate" with Welsh poet Rhys Trimble and Lamin Touray. Sat 1st Oct Black History Month Launch and African Diaspora Day / Diwrnod Diaspora Affrica organised by Hub Cymru Africa and the NW BHM Team with "Black Wales, Our Wales" presentation at Pontio Arts and Innovation Centre, Bangor. Thurs 13th Oct at Galeri in Caernarfon. Black History Month Film Evening, showing "SELMA" the film released in 2015 chronicling Martin Luther King's campaign to secure equal voting rights with an epic march from Selma to Alabama in 1965. Mon 10th - Sat 15th Oct "Hate Crime Awareness Week"
Wed 19th Oct. 7.30pm "Black Wales, Our Wales" event, hosted by Dolgellau Rotary on Dolgellau's links with the TransAtlantic Trade with presentations by Dr Marian Gwyn and discussion. Fri 21st Oct 7.00pm Neuadd Ogwen, Bethesda, featuring the "Irie Bards" - celebrating Poetry links between Wales and Jamaica, Yasus Afari and Rhys Trimble, with Welsh National Poet, Ifor ap Glyn. Sat 22nd Oct 3.30 -6.00pm Neuadd Ogwen, Bethesda, Jamaican Drumming Workshop with Tony Chess Drummers. This is for adult hand drummers with some experience, in preparation for Tribute performance in evening. Sat 22nd Oct 8pm til lae! "Reggae Pesda - Word Sound and Power", with guest Artiste from Jamaica, Dub Poet Yasus Afari, with a Tribute to Count Ozzie with Tony Chess Drummers, local Afro Samba Reggae Band, Bloco Swn and Freedom SoundSystem providing Roots Reggae tunes to top the night off. Sun 23rd Oct 2pm - 4pm Neuedd Ogwen. Talk and discussion on Bethesda's links with the TransAtlantic Trade by Dr Marian Gwyn. Sat 29th Oct 12.00. Bangor Black History Month Drumming Finale in High Street Bangor with workshops and presentations at Storiel, the new Archives facility in Bangor. More information and updates will shortly be included.